Ah, good old Custom Robo. 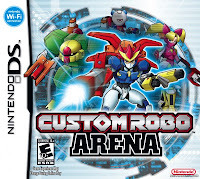 The first Custom Robo game that ever hit European and U.S. shores was for the GameCube, and it was a blast. 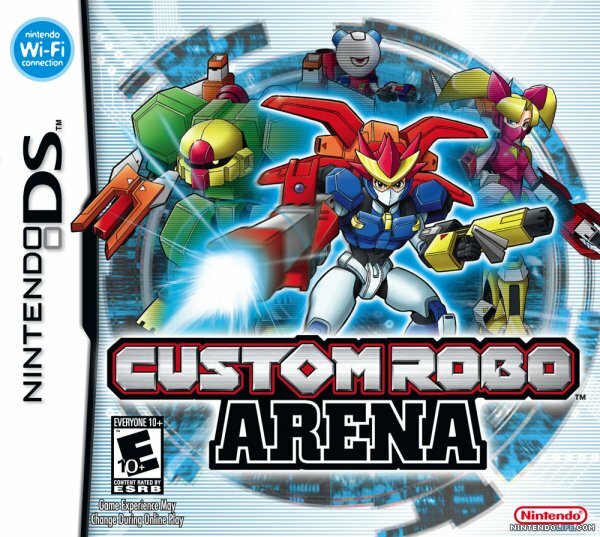 Custom Robo Arena for the Nintendo DS is no exception to that rule. The game’s story is very cliché and is treated as an RPG of sorts. You are the new kid in town, and you receive your very first robo on your first day at a new school. Some kids try picking on your new friends and you find out that you are a talented commander (someone who controls Custom Robos). With your new friends, and a new school, you all set out to become the top Custom Robo team at your school. Along the way, you will battle other commanders to earn money and experience in order to buy additional parts to customize your robo with. You start to meddle in the affairs of a dark Custom Robo gang who uses their robos for crime and other nefarious deeds. Not much of a story, but Custom Robo truly shines due to its simple pick up and play style gameplay. Sporting graphics that bear a striking resemblance to the Nintendo 64 version of the game (a Japan-only release) Arena also boasts the same gameplay from previous installments. The basics of the game are that you control 30 cm. tall robos, and you can customize them with various parts to fit various play styles of your choosing. You can make a robo who specializes in traps and mind games, or you can make a robo that can take and dish out damage. However you want to play is entirely up to you. Robos are made up of 5 parts: Body, which is your robo’s base stats and traits; Gun, which is your robo’s primary weapon; Bombs, which are explosive projectiles; Pods, which are explosive, moving traps, and Legs, which affects your robo’s movement. There are hundreds of parts in total, which gives you a wide range of combinations to play around with. Now, once someone has a combination that they are happy with, they are ready for battle. Battles consist entirely of one versus one battles that take place in various arenas, or Holoseums. Every battle begins with the robos still in cube form. They launch from one of two cannons. Once the cubes have stopped moving, the cube transforms into the robo, and the real battle begins. Each robo has 1000 life, and the goal is to reduce the opponent’s life down to zero first. The battles are treated like an action shooter. Players are constantly dodging and returning fire to one another, waiting for the opportunity to knock their foe down for some free hits. The action stays at a fast pace, and there is never a dull moment with all the fire raining down on the battleground. The game’s multiplayer also adds to the fun factor, especially if friends partake in the action. There is a local multi-card type of play, as well as a DS Download play, which gives both players an extremely limited amount of parts to choose from, but it is great if a friend just wants a taste of what they will get if they purchase the game. The best part about the multiplayer is that the game supports Wi-Fi play. Since battles are only one on one, the game does not have too many troubles with lag. Even though the lag can happen, it does not happen for very long, and isn't too severe. Although the online community has diminished greatly over the years, there are still some Commanders online who will put anyone’s skills to the test. All in all, Custom Robo Arena is just too much fun to pass up. The addicting gameplay will surely get people to play for hours, whether it be with friends or alone.